It’s been a while since I reviewed a book. I guess with all the flooding and power blackout, I can have a few minutes to review this eye-opening book by Susan Cain: Quiet. The Power of Introverts In A World That Can’t Stop Talking. Source: cbsnews.com. Note: the book cover in Indonesia is different. It is plain white. The main premise of this book: Introverts have been a ‘mistreated’ personality in a world that values talking, action-oriented Extroverts. Especially in the West, school and work design has been built around unspoken and unchallenged rule that talking is good, quiet is bad. 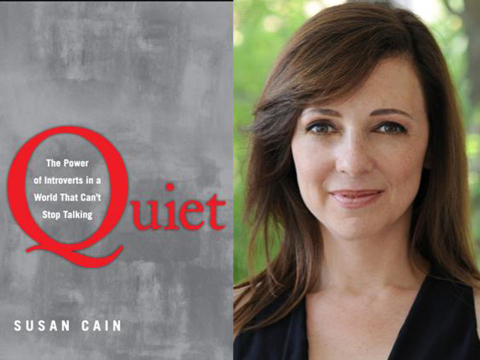 Susan Cain set out to explain what introversion is, why we need introverts in this world, and how to make life better around introvert children. I found the book highly readable, and full with good mix of personal anecdoted and studies from psychology and neuroscience. The author herself is a self-proclaimed introvert. And if you are one, you will feel like reading a book that understands you completely. And if your spouse/children is an introvert, it will greatly help you understand them. Introverts need less outside stimulation, while Extroverts need more. While introverts are happy with reading a book, or quiet conversation, extroverts probably crave for crowd, music, and party. Introverts work deliberately and carefully, and need time to concentrate. Extroverts jump into action and make decision. Although Introversion is not the same as ‘antisocial’, Introverts need some solitude, and tend to avoid conflict. Extroverts need company, and are not afraid of conflict. Introverts are more sensitive. This does not mean they get offended easily. But they can be easily moved by stories, movies, or music. Shy. In fact, extroverts can be shy too. Also, Introversion vs. Extroversion are not binary, “either-or” traits. It is more of a spectrum. Some people can be VERY introvert or VERY extrovert, while most people fall along the continuum, showing a mix of personality. Although I see myself as a dominant introvert, I know that I could behave in extrovert-like personality at times. In the West, Introverts Are Disadvantaged. Today’s Western culture put premium on people who can talk loud, fast, and convincing. These people are deemed to be “natural leaders”, in business and politics alike. Quiet children are sent to psychologists, with parents thinking something is wrong if their kids spend hours building miniature models instead of running around like mad with their peers. But apparently, the reality is different from the illusion. Many effective business leaders are actually the quiet type, who make thoughtful decisions, and avoid the attention. Brainstorm/teamwork is not necessarily superior to individual work. Somehow we have been made to think that a brainstorm is superior in creativity to lone thinkers. Upon further studies, this notion needs to be challenged. Introverts prefer to work in solitude, and solitude can be a catalyst to innovation. In a brainstorm, the loud and aggressive people often drive the discussion, and not because they have better ideas. Brilliant introverts may have better idea, but cannot express themselves well in such high-stimulated setting. What the author recommends is companies to recognise different thinking strategies to accommodate both personalities. Private thinking is to be facilitated, and groupthink is not held above all else. Brainstorming is not necessarily bad, but it is better that participants have been given the chance to think for themselves, before jumping into group setting. This is one way to tap into introverts’ preference of pondering by himself. Introversion/Extroversion may be detected since baby. Another interesting part of the book about the studies that show babies already display temperament tendency. And surprise, surprise. Babies who get excited easily are actually the ones who might grow into introverts. While babies who don’t get excited easily by stimuli grow into extroverts. Although counterintuitive, it actually makes sense. Introverts are sensitive to stimuli (loud noise, parents teasing, etc.) hence they will react to it. Extroverts, who are less sensitive, are not easily stimulated, so they appear more “cool” as babies. Interesting indeed. Culture difference. The author also makes a not that Asian culture are friendly, even appreciate, introversion. This has to do with culture that values harmony above all else. It might also explain why Asian kids excel in subjects that require high degree of concentration, like Math. But if you think Asian quietness is a weakness in global competition, think again. The story of Mahatma Gandhi shows that quiet resoluteness can change the course of a nation. Recognizing and helping your introvert children. A big tragedy is when a perfectly whole child who happens to be an introvert is sent for “therapy”. This is the best message from the book in my opinion. Parents need to recognize and love introverted, quiet children equally as the cheerful, animated, extroverted ones. There is nothing wrong with a child who enjoys solitude and has her own hobby. In fact, often these kids have more profound view of life, or harbor extraordinary talents. Instead of forcing them to become someone who they are not, why not nurture and grow them in their natural persoanlity and talents? These are only some of many fascinating concepts, findings, and lessons you can find in this book. Whether you are an introvert yourself, or you are associated with one, there is good message for everybody. The world needs the thinking, ruminating, creative introverts as much as the make-it-happen, sociable extroverts. When we tap into the strengths of both temperaments equally, wonders can happen. Interesting topic! I can say that I am an extrovert, my wife and my son are introverts, and my daughter is just like me, an extrovert. This topic really make me to understand better to all of people surround me who are introverts, especially how to deal with my son and my daughter. Extrovert vs introvert is not right vs wrong. I remember the 4 personalities, sanguinis, choleris, melankolis, and pleghmatis. The world need all of them to live in harmony. recently read the book. it opened a lot about myself. i’ve understood myself more. i feel like i wanna start a “quiet” revolution at work. i’m an asian that works in a european company that puts more premium on the loud ppl at work.